Without concrete, enforceable emissions targets and transition financing, the Paris climate talks will only deepen our climate crisis. 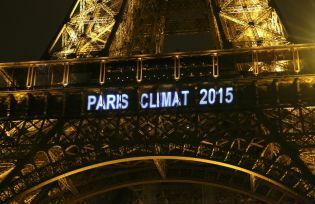 What’s been billed as the meeting that will determine the fate of the planet is now underway in Paris. The outcome of the 21st Conference of Parties — or COP 21, for short — of the United Nations Framework Convention on Climate Change will determine whether the world might be able to keep average temperatures for the 21st century from rising more than 2 degrees Celsius above the pre-industrial average. If they fail, world governments are rushing towards certain climate catastrophe. The stakes are high, the outcome is uncertain. COP 21 is supposed to come up with a treaty to replace the Kyoto Protocol of 1997, an earlier climate treaty that was riddled with loopholes and ultimately sabotaged by Washington’s failure to ratify it. The original aim of the current negotiations, which have been going on for a number of years, was to produce a binding agreement that would require climate polluters to undertake deep cuts in their greenhouse gas emissions, and for rich countries to provide the resources for poor countries to address damage already created by rising temperatures. The operative principle has been that of common but differentiated responsibility — that is, that those who have contributed the most to the volume of greenhouse gases in the atmosphere should carry the main burden of reducing carbon emissions and supporting the efforts of poorer countries to protect themselves from global warming. Unfortunately, the road to an effective climate regime to succeed Kyoto has so far been derailed. Foremost among the climate criminals blocking the way is the United States, the country that’s contributed the greatest volume of greenhouse gases. The U.S. refused to ratify the Kyoto Protocol, providing a terrible example to others — in particular to the government of former Prime Minister Stephen Harper, who took Canada out of the agreement a few years ago as he aggressively pursued fossil fuel development. The U.S. and Canada, however, are not the only villains of the piece. The so-called big emerging economies like India and China have risen fast up the ranks of climate polluters while refusing to take responsibility for their role in deepening the climate crisis. If the U.S. still holds the prize of having contributed the greatest amount of greenhouse gases historically, China is now the world’s biggest polluter on a yearly basis. While tarring each other as climate villains, the U.S. and China have in fact found each other’s opposition of great value, since it gives each of them an excuse for not agreeing to undertake deep, mandatory cuts in emissions. Of the two, however, the U.S. is the clearly bigger problem. Unlike in Beijing, where national leaders at least recognize the climate crisis, Washington’s climate policy is held hostage to a Congress controlled by a Republican Party whose leading politicians refuse to accept basic climate science. A jarring setback to a viable accord was the U.S.-China climate agreement, which the two powers sprang on the negotiations during the last days of COP 20 in Lima last year. The non-binding deal exempted China from reducing its emissions until 2030 and committed the U.S. to a miserly 26 to 28 percent emissions cut from 2005 levels. Beijing and Washington’s separate peace derailed the multilateral process, since they were telling the world that they wouldn’t be bound in the unlikely event of a tough deal emerging from Paris. But what was perhaps most harmful in the U.S.-China accord was the redefinition of the principle of common but differentiated responsibility to “common but differentiated responsibilities and respective capabilities, in light of different national circumstances.” This text was then reproduced word for word in the Lima Call for Climate Action that came out of COP 20. In international negotiations where every word of the agreed text is decisive, this was a major change — a very significant watering down of the basic principle guiding the negotiations to the benefit of the big climate polluters. With the big climate culprits subverting the multilateral process, the UN’s climate conference has retreated from demanding the mandatory emissions cuts to accepting INDCs, or Intended Nationally Determined Contributions. INDCs are voluntary. They’re unilaterally determined by individual governments instead of negotiated internationally. Their implementation will not be monitored by any global mechanism whatsoever, nor will there be sanctions imposed should a government not meet its target. Replacing mandatory targets with INDCs isn’t the only worrisome development in the COP process leading up to Paris. While countries agreed to set up a Green Climate Fund of $100 billion yearly to support efforts by the poor countries to climate-proof themselves, contributions have been slow in coming, with only $10.2 billion raised as of May of this year. Moreover, the amount is paltry compared to the tremendous needs for adaptation by poor countries on the forefront of climate disaster, like the Philippines. Also, there are no guidelines on where the money will come from. The Green Climate Fund is a clear example of the aphorism that the devil is in the details — or in this case, in the lack of details. If an agreement on a post-Kyoto accord is reached on the basis of INDCs instead of deep mandatory cuts — and on vague promises of financial assistance to those most in need instead of concrete commitments — then we ‘ll surely be on the way to a 2 degrees-Celsius-plus world, with all the catastrophic consequences of such a condition: sea-level rise, super-typhoons, prolonged droughts, massive flooding. Indeed, one study of the INDCs submitted so far concludes that the total won’t even prevent global mean temperatures from rising 3 degrees Celsius. At a minimum, a viable climate deal must have deep mandatory cuts in emissions by all developed (“Annex 1”) countries and the big emerging economies, and it must have secure commitments for massive funding for poor countries to compensate for the damage done to their ecologies. Over the next two weeks, global civil society must mobilize to pressure the representatives of governments assembled in Paris to produce a post-Kyoto agreement with these essential provisions. Civil society must also tell the governments in Paris to stop wasting time on schemes favored by corporations like carbon trading, carbon offsets, and tree planting programs like REDD+. These are false solutions that only deflect attention from the need for binding commitments. Without these binding commitments and sanctions for climate polluters that fail to meet them, the world must reject a Paris climate deal. Otherwise it will simply legitimize inaction and irresponsibility, thus accelerating the climate crisis. With such high stakes, in other words, no deal is better than a bad deal. Even if an acceptable deal is reached, it will provide only a temporary solution. A Paris deal must be followed up by an agreement to keep coal, oil, and other fossil fuels in the ground, with fair compensation to developing countries dependent on them for part of their income. Strategically, the solution lies in the world’s turning away from capitalism, a mode of production that insatiably and incessantly transforms living nature into dead commodities, creates destabilizing growth, and promotes over-consumption. However, a mandatory Paris climate deal is a necessary first step away from this condition of uncontrolled production and consumption that has brought our planet to the edge of disaster. We want a planet that sustains life, not one that is driven on the road to death by corporate greed. Foreign Policy In Focus columnist Walden Bello is a member of the House of Representatives of the Philippines and a senior analyst at the Bangkok-based research and advocacy institute Focus on the Global South. Foreign Policy In Focus columnist Walden Bello has been active in global civil society discussions and mobilizations around the climate. An earlier version of this piece appeared at Telesur.